I’m finding it hard to write any kind of an unbiased review about this set because I love it so so much!! 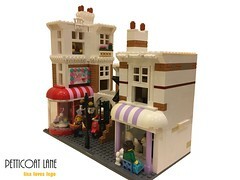 For an AFOL who’s interested in creating a Lego Town, Friends sets are a great way to add something other than police or fire to your layout; and while many Lego Friends sets are generally a bit brighter and more ‘out there’ than many Lego City sets, this is one really takes the biscuit (or should that be hotdog bun!). What a fun design. The hot dog truck is literally a hot dog truck, and makes clever use of round corner dome pieces in flesh to create the buns and red 2×2 dome to create the sausage. 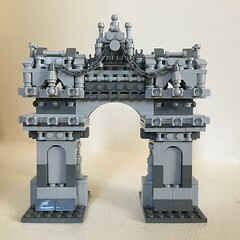 The build itself is good too – there’s enough detail to keep most AFOL’s interested, while at the same time not being over complicated for newer builders. 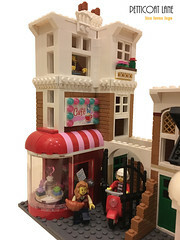 For kids (and us AFOL’s) this set has masses of playability. There is a rooftop seating area on top of the truck which is accessed via a ladder, and the roof also comes off to allow access to the interior (which has a grill area at one end and the steering wheel at the other). 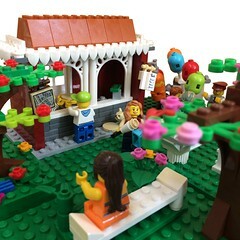 The set comes with 2 minidolls – Nate and Stephanie (which you won’t find in my pictures because I give mine away! ), and some other nice features, including two stools, a sign advertising the truck and best of all – a photobooth! See what I mean about masses of playability?! Just to mention that these are all my own minifigures and don’t come with the set! Oh, and I nearly forgot – this set also comes with the Hot Dog Guy costume from Collectable Minifigures Series 13! …luckily he got to pick up some extra work!